The ability to recognize an opportunity to excel, or exceed customer expectations, is a valuable asset that companies look for in their employees. Latoya demonstrates this innate quality on a daily basis. Our fresh crab is a popular dish at the Alaska Fish House, though it does take a little effort to eat. Occasionally, Latoya has had call to sit with some customers and open their crab for them. One example, however, stands out as an exceptional portrayal of Latoya’s customer service acumen in the way she handled the situation. A customer approached her, explaining that she was having difficulty with her food. As they approached her table, the customer was basically yelling at her because she couldn’t shell her crab, so Latoya, as she had in times past, volunteered to do it for her. Latoya stood there for the guest’s entire meal opening every piece of crab, even though the customer berated her for the duration. Even though the customer was still irate, Latoya offered her guest more crab on the house, despite the knowledge she’d be opening every piece of that as well. Though the customer refused and left the restaurant, Latoya was able to continue her day with a smile, proud that she had done everything she could to please her customer. She was even congratulated by several other patrons that had seen the situation unfold and commended her for doing an amazing job. One couple put it perfectly when they told Latoya, “You did an awesome job, that was the best display of customer service we’ve ever seen”. Examples like these, and there are many, are why we’re proud to have Latoya Thomas as a leader on the Alaska Fish House team. Anyone familiar with Ketchikan knows that the downtown waterfront is dominated by the cruise ship docks. From berth one, adjacent to the Salmon Landing market and Thomas Basin (where our restaurant is located), and stretching down to berth four, pedestrians can find it a difficult hike getting from one end to the other. Although it is a straight shot, the high foot traffic, busy one lane road, and regularly inclement weather can make the journey seem a bit longer than the mile or so that it actually is. Chatting with an elderly couple during their meal, Latoya found that the husband and wife had hoofed it all the way from berth four just to visit the Alaska Fish House. They were tired and not looking forward to the walk back to their ship, so Latoya had one of her servers hop in the van and get them back to their boat while she covered the server’s duties. While we don’t typically offer logistical support to those desiring a meal with us, Latoya recognized an opportunity to exceed expectations and took it. Latoya Thomas, like so many of our summer citizens, came to Alaska on a sort of “working vacation”. Whether drawn north for the job itself, or the opportunity to spend a summer in Alaska without going into the red, a lot of Alaskans came for a visit that ended up lasting years. Originally from Louisiana, Latoya arrived in Ketchikan with years of experience in hospitality and customer service with a desire to “experience something different”, eventually taking a seasonal position at the Alaska Fish House. Now working year-round due to her outstanding work ethic and skill set, you’ll find Latoya down in the trenches during the summer season managing the restaurant floor, and overseeing improvement projects during the off-season. Every summer, over one million visitors, from all different walks of life, arrive in Ketchikan as they travel through Southeast Alaska. With such a diverse array of guests, those in the service industry end up with quite a few stories by the end of the season. 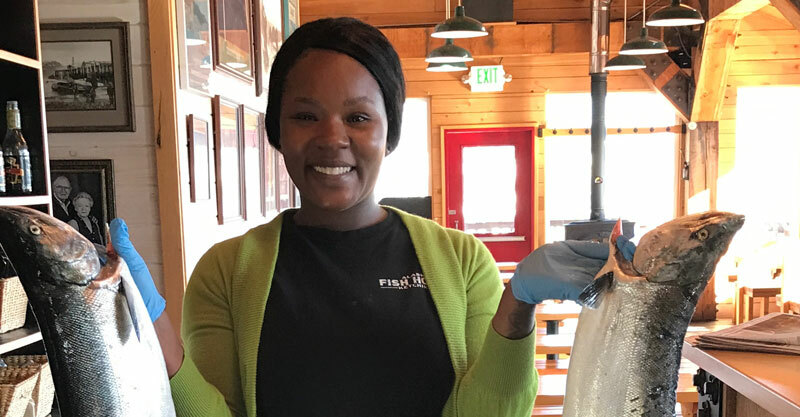 Latoya Thomas has had a couple interactions with our customers that we feel exemplifies perfectly the type of team member we value at the Alaska Fish House. Not one to toot her own horn, we though we’d do it for her. Our captain’s report on up-to-date fishing conditions, regulations, and trends. Nothing breaks you into the beauties of the Misty's like a week paddling through her splendor. Fishing limits and the Fish & Game’s reasoning, and what it means for Baranof’s guests. Misty's, Hot Springs, Fishing, Crabbing, and wildlife; the experience of a lifetime. Stories told by our guides, from local children, commercial, Ketchikan historical stories.